HTC Explorer, the low budget phone from HTC get some love from Developer community. 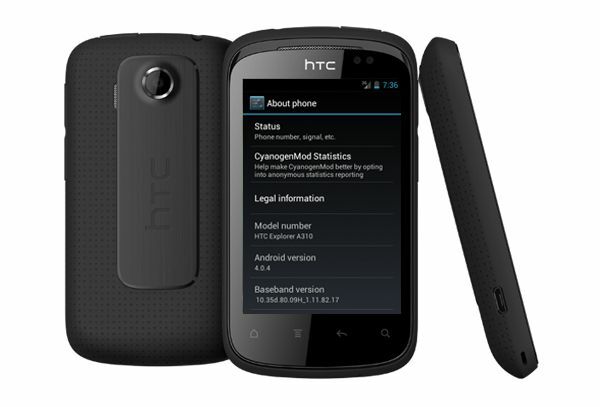 Unofficial Build of CyanogenMod 9 is available for HTC Explorer. CyanogenMod 9 is based on Android 4.0 Ice Cream Sandwich and it brings all ICS and other CM goodness to HTC Explorer. Officially you won’t get Android 4.0 ICS update for HTC Explorer but you want to taste ICS, you can try this ROM. Right now ROM is suitable for daily use but problem may occur as it yet to hit stable version. I assume you downloaded ROM zip file and Google Apps zip file from above link. Connect your phone to PC and mount it as ‘Disk Drive’ so that you can transfer files on it. Wait for process to complete, After the installation is finished, now flash Google Apps in a similar way (No need to clear cache). Go back to main menu and select ‘Reboot now’ to reboot your phone in normal mode. Kudos! You’ve successfully installed CyanogenMod 9 ROM on HTC Explorer. After installing cm9, it showing super user stopped unexpectedly and I can’t get root access. USB tethering is not working. Hi! Excellent. Is it CM9 or CM9+ ROM? Excellent worked Rahil, Brother only one thing, after installing the CM9 so normal, but the phone will not let me move it just stays in the setup wizard, tells me touch the screen after configuring everything again and again wizard. I tried restarting and nothing. Do you recommend I do? Restart the process again and after installing ROM from SDCard, do wipe data and cache. You could have added a step about creating an ext3 and a swap partition on the SD Card. Some visible changes in performance can be noticed. Great tutorial, that helps me with my HTC Explorer. Thanks a lot!